Rage. Rest. Repeat. This was the motto printed on flyers around Boulder promoting Umphrey's McGee upcoming Red Rocks show, and it was the one the band adhered to faithfully on Friday night. Mixing in a high-energy varied set list with their unique, dynamic musicianship, Umphrey's proved why they are one of the best live bands, jam or otherwise, performing today. The show began with Delta Spirit providing an enthusiastic, if fairly straightforward, performance to the smattering of fans that had made their way into the amphitheater. Most folks were still in the parking lot tailgating, but the band didn’t seem to care and were clearly enthused to be playing Red Rocks for the first time. The other opener, the more established Dr. Dog, played to a much larger crowd and delivered the same stellar show I have come to expect from them. The set leaned heavily on 2012’s well-received Be The Void, but there were enough older songs to satisfy the longtime fans in attendance. Bassist and singer Toby Leaman crushed “The Beach” and “Lonesome,” howling his vocals as he climbed over the railing to interact with fans. 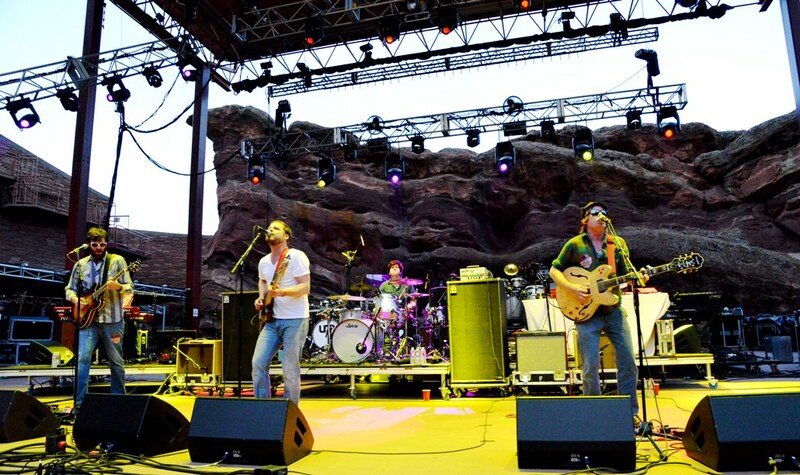 Dr. Dog also opened for Wilco at Red Rocks last year, and if the audience reaction is any indicator, they will get their own headlining slot sometime in the near future. This night, however, was really all about Umphrey’s McGee. Unlike their other peers on the jam scene, Umphrey’s eschews spacey noodling for a more technical, precision-based diverse sound. Their influences are all over the map. Friday night’s show featured mostly metal and funk, but they truly can play anything they want. When it all comes down to it, though, Umphrey’s is a progressive rock band. The arrangements and progressions of the songs themselves are incredibly complex, yet the band (featuring Brendan Bayliss and Jake Cinninger on guitar and vocals, Joel Cummins on keyboards, Ryan Stasik on bass, Kris Myers on drums and Andy Farag on percussion) remained tight throughout the night. The set began with the band marching onto stage to the tune of “In the Hall of the Mountain King,” an appropriate song considering the setting. The band immediately kicked things into gear with the first part of “Divisions” into “The Floor,” which featured a subtle “Don’t Fear the Reaper” tease. “40’s Theme” into “In the Kitchen” had some funky, soul-influenced guitar that kept the crowd grooving, while set closer “Miss Tinkle’s Overture” was full-bore prog metal at it’s finest, complete with pyrotechnics. 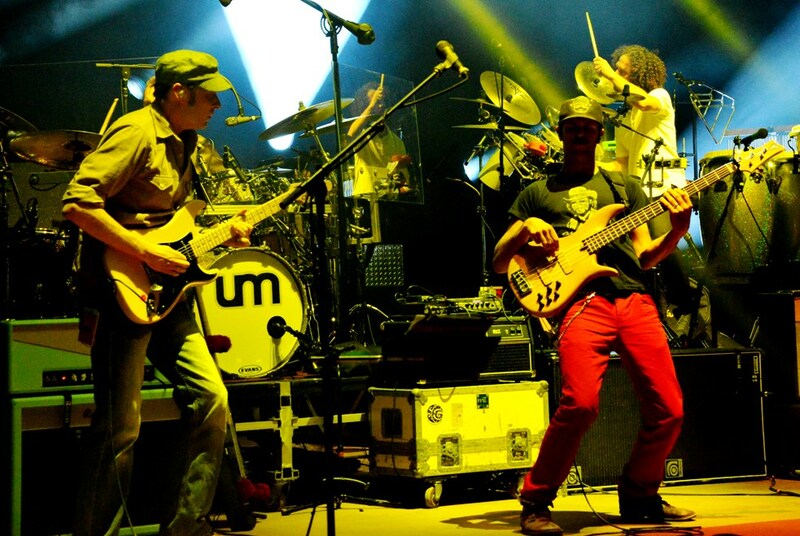 It takes serious talent to navigate as much musical ground as Umphrey’s does. Perhaps no song embodied their experimental song structures as much as “Frankie Zombie.” It came near the end of the first set, and it’s a relatively new song that mashes together “Relax” by Frankie Goes to Hollywood and “Thunder Kiss ‘65” by Rob Zombie, with a dash of “Have a Cigar” by Pink Floyd thrown in there for good measure. That’s quite the musical mulligan stew. A lesser band would no doubt get lost in the instantaneous timing transitions, but then again a lesser band probably wouldn’t have undertaken such a feat to begin with. The second set saw the band pick up right where they left off. “1348” came fairly early, as Cinninger and Bayliss swapped gnarly, melodic guitar solos to the crowd’s delight. Stasik and Cummins shared the spotlight on “Push the Pig,” slowing things down with a slick bass-and-keyboard duet. The largest crowd reaction came after a rousing rendition of “Glory” led back into the rest of “Divisions,” from the first set. The band ended the second set with the rarely deployed cover of AC/DC’s “Thunderstruck.” Cinninger did a more-than-passable Brian Johnson impersonation on the vocals, and the aforementioned pyrotechnics made a glorious return, shooting towers of flames behind the band. Then, as if the fire fountains weren’t enough, they launched fireworks into the pleasantly warm night air as the song ended. Speaking of pyrotechnics, I would remiss if I didn’t mention the light show. Umphrey’s light technicians are almost as incredible as the band itself. 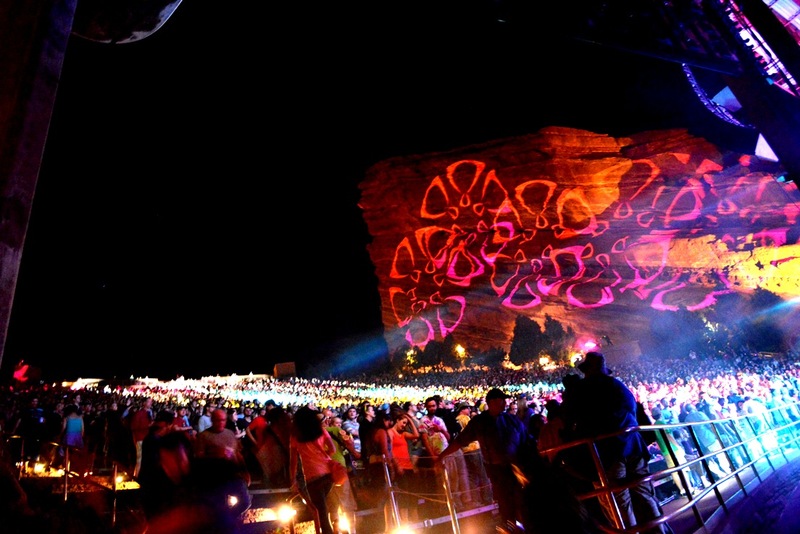 Instead of using an LED display, the band uses an impressive array of rotating angled flood lights, with patterns and colors that took excellent advantage of the natural beauty of Red Rocks. The lights were on point, able to keep up with every complicated transition Umphrey’s made, and that’s a feat in itself. After coming out for the encore, Umphrey’s announced they’ll be returning in December to play three nights at the Fillmore for New Year’s. The weary but still game crowd roared in approval, and Umphrey’s launched into the beginning of “Preamble” which led to the prog-rock journey that is “Mantis.” It was the perfect closer for one hell of a show. 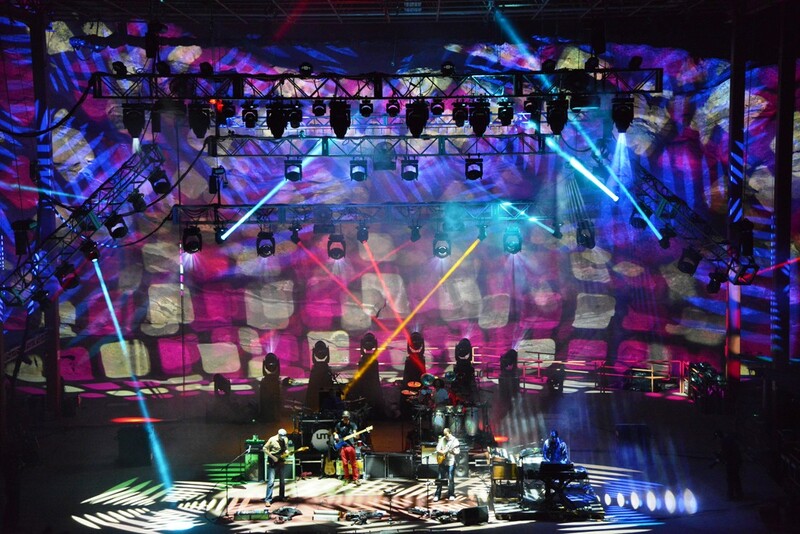 Right now, Umphrey’s McGee is in their prime, and landing the coveted New Year’s Eve slots at the Fillmore shows that more and more people (at least in Colorado) are starting to take notice. The success is an excellent reward for a band that clearly has put in a lot of effort to reach the point they’re at today, and their future appears brighter than ever.